There’s been talk lately about finding a retreat where we could go as writers and be able to devote as much time as we want on writing. I have found such a place within a thirty to forty minutes from London. 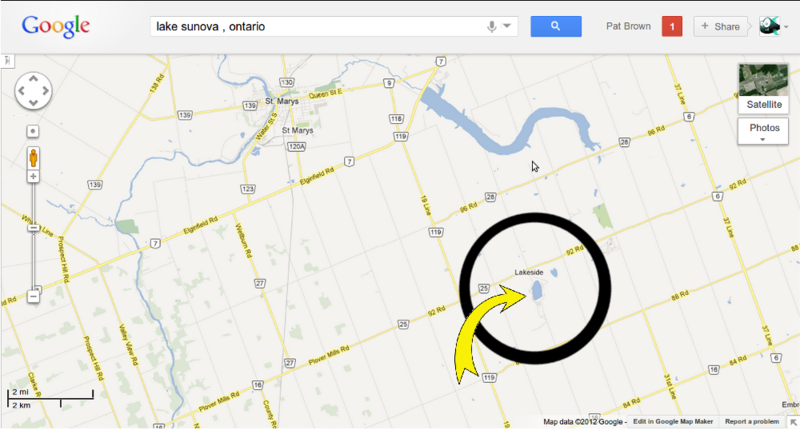 It’s located half way between St. Mary’s and Woodstock, as the crow flies, on Sunova Lake. She suggested November. We can have it for $300 for a month – actually from November 1 to December 14. Anyone can come out during the week or on the weekend, three people at a time. It’s non-smoking and no pets. We will need to bring in food and supplies. The owner, Penny Poole, only wants the place left clean. Anyone who’s a member of the London Writer’s Society can use it. I need to know as quickly as possible who is interested. Below is a map. This entry was posted in Uncategorized and tagged authors, field trips, writing, writing retreat. Bookmark the permalink. If people want to go, they need to say so now. If we wait much longer we’ll lose it. You don’t have to pick the time you want to go, that can be decided later. Right now I just need a show of hands. There is growing interest in this, now all I need is to hear back from Penny, the owner. I’ll post more as I learn more. To clarify some things. The $300 covers the entire 6 weeks. We’d be sharing the house with another LWS member, assuming enough people want to come. Maximum of 3 at a time. Food would be up to each person. Great, glad to hear there is interest. I’m still interested too and thanks for the clarification above. Will watch for more info.